I’m now at the half-way point and really starting to get into the flow of this. I’ll be honest, the first few days were a bit hard and I felt like I was depriving myself – mind you, it was just after the excesses of Christmas – but now I’m really enjoying it. This was supposed to be a history challenge, not a weight-loss diet, but amazingly, in spite of having three courses which include a pudding every night, I’ve lost 6 pounds in two weeks. I have more energy and I’m sleeping better. I wonder if it’s because all the food I’m eating now is fresh and made from scratch? The only processed foods I’m currently consuming are bread, flour and sugar. An interesting experiment in Britain nearly ten years ago, saw a group of schoolchildren being fed wartime rations while their classmates continued to eat 21st century meals. Eight weeks later, the ‘wartime’ children had grown in height, while the 21st century children had grown in width. The modern-day 9-year-old now weighs, on average, 17 lbs more than the 9-year-old of 70 years ago. Sober reading indeed. Anyway, back to my rations. 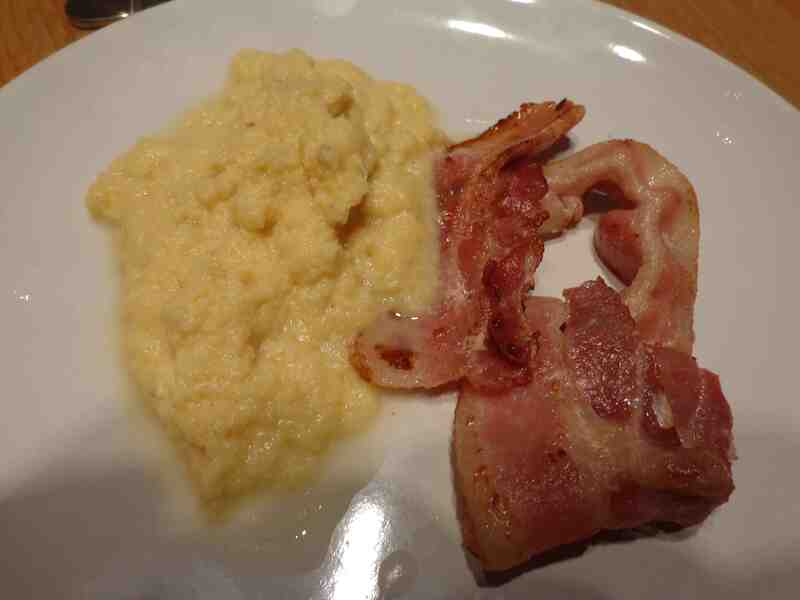 With it being Sunday morning, I decided to forgo my regular porridge for some bacon and eggs. The bacon was great, but the eggs… I only had powdered left so I scrambled them. Not a great success. The only way I found them edible was to put them on toast and add a piece of bacon to every bite. From now on I’ll keep them for baking. But in the reading I’m doing, it sounds like children who grew up eating powdered eggs preferred them over the real thing for a long time after the war ended. This entry was posted in History, Wartime Rationing and tagged rationing, wartime memories, wartime rations, World War Two. Bookmark the permalink.